From Carlisle to Stafford, Harrogate to Builth Wells, Wyn Williams is one of the band of dedicated Welsh exhibitors supporting commercial beef competitions across the UK. He has had a fair degree of success, too, but the ultimate accolade would be to secure the top championship at the Royal Welsh Winter Fair – the ultimate challenge for finished cattle producers. 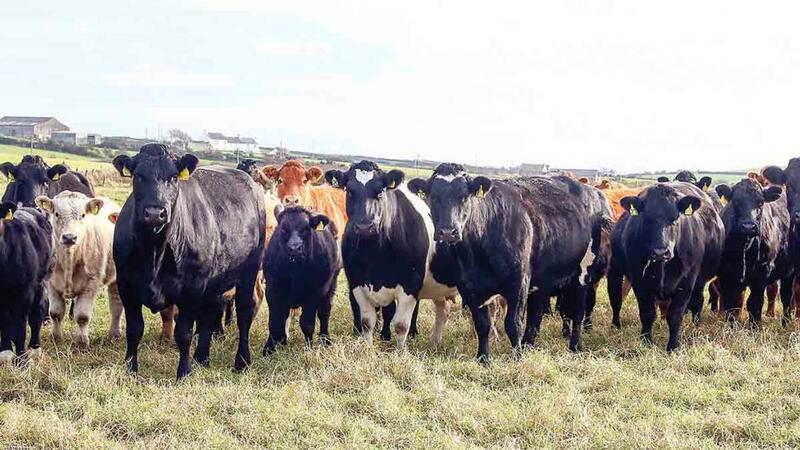 But what makes the Anglesey-based beef and sheep famer different is all the stock he shows is bred on the family’s 178-hectare (440-acre) coastal farm. Nothing is bought-in and that counts for the feed as well. Overlooking Penrhyn Bay and within sight of Holyhead’s Irish ferry terminals, his 200 suckler cows, apart from at calving time, are kept outdoors all-year-round thanks to about 60ha (150 acres) of the ground being pure sand. 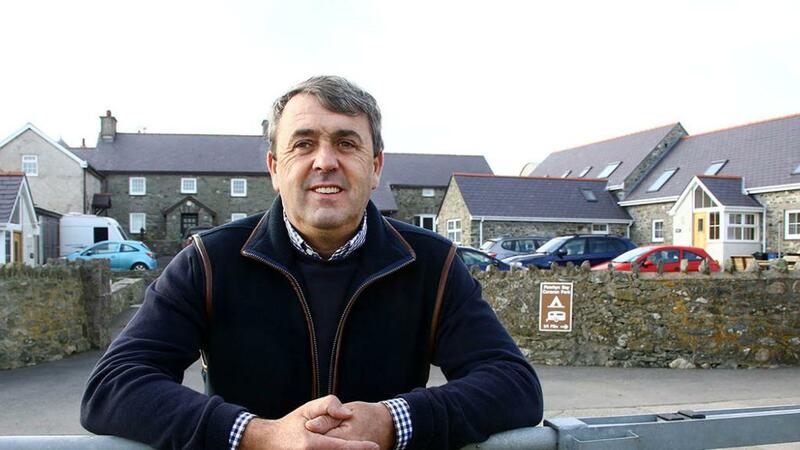 As the fourth generation of the family to farm at Penrhyn Farm, Llanfwrog, Wyn farms with his wife Gwen and they have three daughters, Ffion, Mari and Lowri. Although he views competing in the showring as more of a hobby, it does have a significant business spin off, with a large proportion of the annual calf crop being sold straight off the farm to buyers who value the quality of his stock. “Out of the 170 stores we sold last year only 40 went through the auction ring. The rest were sold from home,” says Wyn. Over the years a number of his calves have gone on to win prize cards in other people’s hands but there have been many in his own name – among them a reserve championship at the Countrywide Live event and a string of successes at the Welsh Winter Fair. “Spotting a possible winner is part of the thrill,” he says. “I have my favourite cows which hopefully will produce potential winners – but a large part of it is really down to luck and what favours the judge on the day. As well as the cattle there are 350 ewes comprising Suffolk cross Mules which go to Beltex cross Texel rams and Texel cross Mules put to Texel tups for indoor lambing from the beginning of February. All the lambs are finished off grass for selling both liveweight and deadweight. While cattle numbers will largely remain constant, the number of ewes could be increased to 450 over the next few years to utilise some additional land that has been taken on board. A one-time dairy holding, it was the need for a major £250,000 investment more than 20 years ago that saw 120 dairy cows being switched for 120 suckler cows and today the farm employs just one full-time worker. “My heart was always in beef and sheep so I was not really sorry to see the milkers go. We sold the quota and bought 60 acres of extra ground with the money,” says Wyn. With the aid of grant funding a new sheep and cattle handling system has recently been installed on the perimeter of the farm. “It means that if we need to handle livestock we do not have to transport them all the way home and that saves us a great deal of time,” he adds. Away from the farm Wyn is widely known for his long-standing support for the annual Anglesey County Show in the role as chief cattle steward. The chances are when the commercials are being judged, more often than not he takes time out to cast his eye over what his rivals will have on offer for the winter show circuit. Alongside the farming operations, Gwen looks after four self-contained high quality holiday cottages which have been converted from a range of outdated traditional stone-built buildings. That has provided an introduction to Anglesey’s thriving tourism industry, not that sharing their lives with visitors is new to the couple, both having grown up within that environment. To that end, members of Wyn’s family operate a large caravan site in the area and Gwen’s family has a successful bed and breakfast and self-catering business on the island. Investing in the holiday cottages was, however, at the time considered to be a bold move but certainly one that has paid dividends by providing an additional income source. They are proving so popular many visitors are keen to book them for the key holiday periods two years or more in advance, especially during school holiday times. “The spring half-term is proving to be very popular with us because it tends to coincide with lambing and there also appears to be a great deal of interest when the cows are calving. Indeed, we once had the vet here performing a caesarean, with an audience of 15 people watching.” says Wyn. Visitors are encouraged to take an interest in the farming activities and running through the heart of the farm is not only the Isle of Anglesey Coastal Path but a network of footpaths adding up to about three miles. That makes working in harmony with the public a necessity. “We get thousands of people walking the coastal path every year from all corners of the world and while on the whole they are welcome there are concerns over a growing pressure to increase public access even further, as well as possibly converting existing footpaths to allow their use by cyclists and horse riders,” says Wyn. It is Wyn’s view farmers should be rewarded financially for allowing the public to cross their land, and for good reason. “At certain times of the year, when the cows have their calves at foot or we want to turn the bulls in with the cows, we are not able to graze those fields that have footpaths crossing through them for safety’s sake. Farming in such tourist-rich areas is not without its problems, he adds, with roaming dogs and gates being left open. “We find that 99 per cent of visitors have a genuine love for the well-being of the countryside but then there are a few irresponsible ones. From our point of view we are very strict on the docility of our cattle and any that could be doubtful are taken out,” adds Wyn. But the prospect of there being more open access to the countryside is something that fills him with awe and he worries as to just who would be responsible for the consequences. On a more positive note, Wyn believes whatever Brexit brings Welsh and British farmers have a major role to play going forwards.